The first body of work I completed after earning my MFA from Ohio University was Yard/distortion, and the series marked an important moment for me as a painter. Rather than establishing a style, I learned to seek new ways to transform a subject through the act of painting. While living in Michigan in the first decade of the new millennium, I created the work shown here in the Ecology of forms and Quasi-organic galleries. 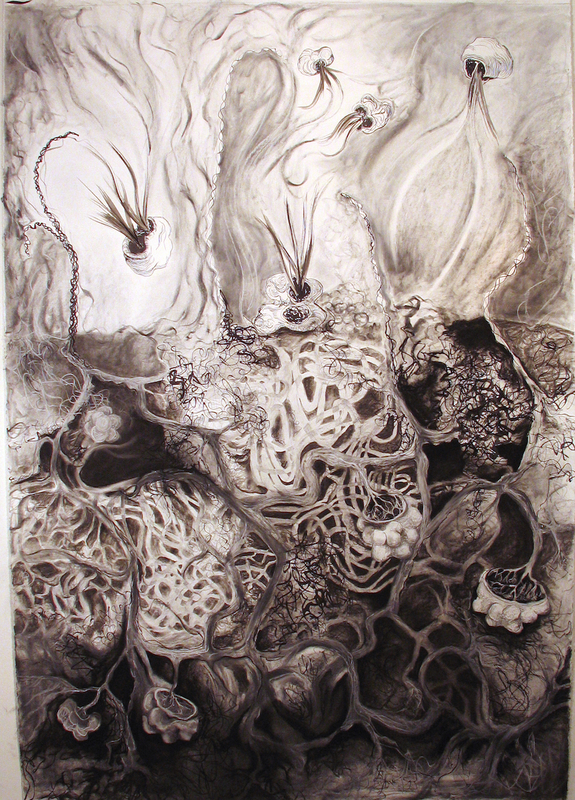 Drawings and paintings inspired by the biological world were often process-based. Shapes and tendrils suggest synapses, cellular structures, plants, and the human body. A hiatus from artmaking happened when I moved to Chicago to start a new career in early 2012. Now, I’m finding the time and space in which to make paintings again. The newest pieces are inspired by physics and science fiction, which seem to offer endless freedom for me to explore universes where anything can happen.